I take several firearms classes every year. As of this writing, I’ve taken 64 hours of professional training this year. For comparison, police officers in my city are required to only take forty hours of total training, with no requirement to take any firearms or self defense training. In addition, Sedagive? has taken quite a few classes this year herself. Anyway, that adds up to a lot of shooting. We shoot between 250 and 600 rounds each per class. Ammunition has been hard to come by, thanks to the scare Democrats put on the gun industry this year. We mostly shoot 9mm, and the price of practice ammunition has skyrocketed. Even steel cased ammunition was selling for $12 and up for a box of 50. I used to buy it all day long at $8/50 or less before the anti-gun crowd threw everything into disarray. Thankfully I had some put away and developed some coping techniques so we could train as much as we wanted. However, the high cost and low availability has kept many from training this year. I started looking at ways to keep the ammunition cost low while maintaining our standards of training. Here’s my review of the Advantage Arms .22LR conversion kits for Glock 19 handguns. 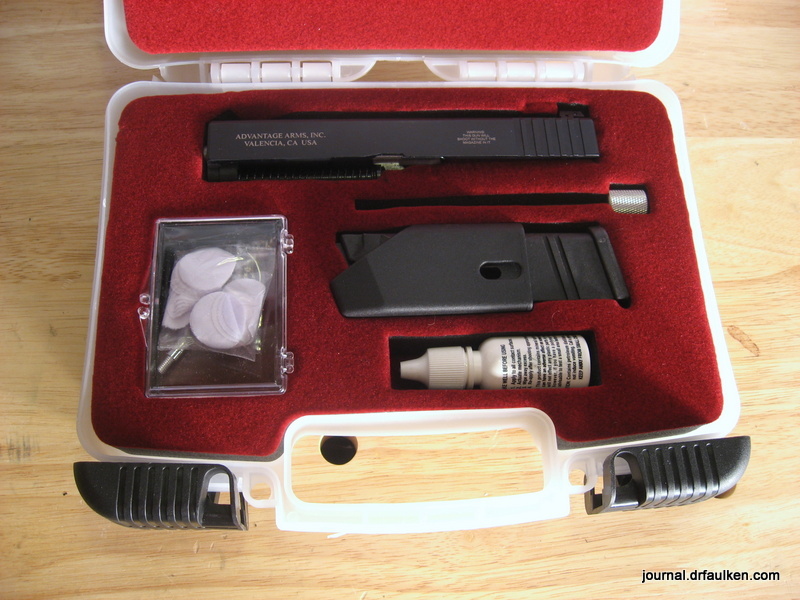 The Advantage Arms kit allows you to shoot less expensive .22LR ammunition in your Glock handgun. You replace the 9mm slide with the .22LR slide and use special magazines that fit into your existing Glock frame. The kit is supposed to sell for $250 or less (I bought mine online for slightly under $240 before shipping). However I’m not the only one who got the bright idea to train with .22LR instead of 9mm and the kits are scarce. Opportunists on Guns America and GunBroker are selling kits for as much as $400. You have to be careful; there are some kits that only work with Generation 4 Glocks. These are clearly marked, but you have to be aware of what you’re buying. The other kits can work with the three prior generations of Glocks. There’s a myth going around on the Internet that you can use the a Gen 4 kit on a Gen 3 pistol and vice versa if you use different springs, but that’s not true. Advantage Arms includes a cleaning rod and patches, lubrication oil, magazine, slide, and instruction manuals. The Glock conversion kit ships with a 10-round magazine, but since I live in a free state I bought as many 15 round magazines as I could. Magazines are expensive at about $22 each before shipping. Let’s state it plainly: the kit is not going to work reliably with the majority of .22LR ammunition that’s out there. CCI MiniMags (40 grain round nose not hollow points), Remington Golden Bullets 550/525 round Bonus Back, CCI Blazers, Federal AutoMatch. CCI MiniMag hollow points, any Winchester ammo, any Federal ammo other than AutoMatch, Remington Thunderbolts, CCI Stinger or any other hyper velocity ammo. The kit works pretty well with Aguila SuperExtra or Aguila SuperMax Hypervelocity ammunition, but still not 100%. Reliability is around 33% – 50% with most other brands of ammunition. Remington Golden Bullets, despite being Advantage Arm’s extremely sparse “good ammo” list, doesn’t work 100% either, probably closer to 75%. Most of the malfunctions are feed related, either failure to feed or double feeds. Less potent ammunition throws in failure to eject problems. However, when the kit works it’s magical. Recoil from a .22LR round is obviously much less than a 9mm, so you can really concentrate on sight picture and trigger control. It’s a lot of fun, and even with over a dozen rounds sacrificed to malfunctions at a recent handgun class I still shot for less than two boxes of 9mm. Here is some footage from a basic handgun class I took last weekend. That sums up my experience with the kit: sometimes great, but count on malfunctions. I train with two pistols and a total of five magazines, so that’s $590 in equipment alone. Due to the finicky nature of the kit I’ve had to buy more expensive .22LR ammunition, which has also been difficult to find. I already had a bunch of lesser-grade ammunition to shoot in my other .22LR firearms, so having to scrounge for better ammo detracted from the AA’s theoretical benefit. As I wrote earlier, when the kit works it’s great. I shot all day for $15.06. Equivalent 9mm cost a panic-era pricing would have been $58.23. At that rate, it would take 13 classes to break even on equipment cost. That’s about a year and a half of handgun training. If I had to do it all over again, would I? Probably not. I knew the ammunition compatibility was going to be a problem, but comments on the Internet indicated that more modern kits and updated magazine designs allowed for a wider range of acceptable ammo. It is difficult to find the three or four ammunition types that work really well with the kit. This also diminishes the “effectiveness” of the conversion. The ideal situation would allow me to shoot the widest range of .22LR possible at the widest variation in ammo price as possible. The Advantage Arms conversion kit is great if you want to help train yourself other people on recoil management or trigger control. I think spending the money on the kit is a smart one compared to buying a dedicated .22LR pistol for training, especially since there aren’t any full .22LR pistols that come close in mimicking the Glock controls, grip, trigger feel, etc. all in one package. The conversion kit is not an effective way to save money if you do high round count, fight focused training. The necessity of higher-grade ammunition is a downer, especially due to the political and logistical climate of last year, this year, and probably the next few years to come.